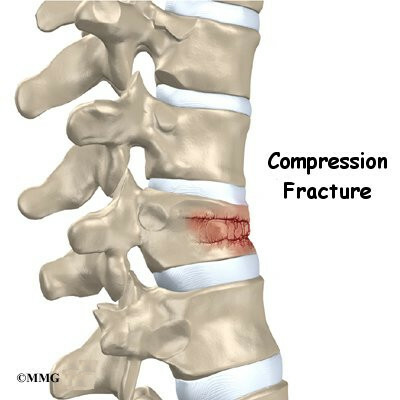 Compression fractures are the most common type of fracture affecting the spine. A compression fracture of a spine bone (vertebra) causes the bone to collapse in height. Compression fractures are commonly the result of osteoporosis. About 700,000 cases of compression fractures due to osteoporosis occur each year in the United States. Spine bones that are weakened from osteoporosis may become unable to support normal stress and pressure. As a result, something as simple as coughing, twisting, or lifting can cause a vertebra to fracture. An injury to the spine, such as from a hard fall on the buttocks or blow to the head, can cause a spinal compression fracture. Compression fractures may also occur if cancer from other parts of the body spreads to the spine. Cancer weakens the spine bones and makes them prone to fractures. The human spine is made of 24 spinal bones, called vertebrae. Vertebrae are stacked on top of one another to create the spinal column. The spinal column gives the body its form. It is the body's main upright support. The main section of each vertebra is a large, round structure called a vertebral body. Compression fractures cause this section of bone to collapse. When the fracture is due to osteoporosis, it usually occurs in the lower part of the thoracic spine, near the bottom of the rib cage. A bony ring attaches to the back of each vertebral body. When the vertebrae are stacked on one another, the bony rings form a hollow tube. This tube, or canal, surrounds the spinal cord. The spinal cord is like a long wire made of millions of nerve fibers. Just as the skull protects the brain, the bones of the spinal column protect the spinal cord. Severe compression fractures from forceful impact on the spine, as can happen in a car accident, can cause fragments of the vertebral body to push into the spinal canal and press against the spinal cord. This can cause damage to the spinal cord that can result in partial or complete paralysis below the waist. It is rare for a typical compression fracture from osteoporosis to cause damage to the spinal cord. Strong, healthy bones are able to withstand the forces and strains of normal activity. Compression fractures in the spine happen when either the forces are too great or the bones of the spine aren't strong enough. The vertebral body cracks under pressure. Fractures from forceful impact on the spine tend to crack the back (posterior) part of the vertebral body. Fractures from osteoporosis usually occur in the front (anterior) part of the vertebral body. Osteoporosis is a disease that weakens bone. Sometimes the bones in the spine weaken to the point that even mild forces can lead to a compression fracture. A simple action like reaching down to pull on a pair of socks can cause a weakened vertebra to fracture. The front of the vertebra (the part closest to the front of the body) crumbles, causing the round vertebral body to become wedge-shaped. This angles the spine forward, producing a hunch-backed appearance, called kyphosis. Diseases or conditions that affect the parathyroid gland can also weaken bones. Four pea-sized parathyroid glands are located just behind the thyroid gland in the throat. They produce a substance called parathyroid hormone (PTH), which normally regulates the amount of calcium in the blood stream. An overactive parathyroid gland releases too much PTH, causing the body to leach calcium from bones, even when there is more than enough calcium circulating in the blood stream. This disorder is called hyperparathyroidism. It occurs when a tumor, called an adenoma, forms in one of the parathyroid glands. Cancers that affect the kidney, skin, or parathyroid gland may also cause the parathyroid gland to malfunction. If the problem isn't fixed, bones continue to lose calcium and eventually weaken. Weakening in the spine bones makes the vertebrae more prone to crack in front, as is typical with osteoporosis. Cancers that form in other parts of the body have a tendency to spread, or metastasize, to the spine. When this happens, the cancer weakens the spine bones, making them susceptible to compression fractures. Doctors may suspect unrecognized cancer if a patient has a compression fracture without any particular cause or reason. Spine trauma can produce mild or severe compression fractures. Compression fractures from trauma usually involve high forces that impact the spine when it is bent forward. This is typically what happens when a person falls onto the buttocks or strikes his head on the windshield in a car accident. Again, these traumatic fractures usually affect the back part of the vertebral body. Compression fractures caused by thin, weakened bones may cause little or no pain at first. Sometimes pain is centered over the area where the fracture has occurred. The collapsed vertebra gives the spine a hunched appearance, and the loss of vertebral height shortens the muscles on each side of the spine. This forces the back muscles to work harder, causing muscle fatigue and pain. When pain does occur, it usually goes away after a few weeks. However, back pain sometimes escalates to the point that patients seek medical help. Traumatic compression fractures can produce intense pain in the back that spreads into the legs. If the fracture severely damages the vertebral body, bone fragments may lodge in the spinal canal, pressing on the spinal cord. This can paralyze muscles and impair sensation in the areas supplied by the damaged nerve tissue. Such a fracture may also cause the spine to become unstable. When this happens, the spine eventually tilts forward into increased kyphosis, and the potential grows for future complications with the spinal cord. Diagnosis begins with a complete history and physical examination. The doctor asks questions about your symptoms and how your problem is affecting your daily activities. These include questions about where you feel pain and if you have numbness or weakness in your limbs. Your doctor will also want to know what positions or activities make your symptoms worse or better. Then the doctor examines you to see which back movements cause pain or other symptoms. Your skin sensation, muscle strength, and reflexes are also tested. The doctor uses gentle pressure to feel the tissues over the sore area, since compression fractures often cause soreness and tenderness in the muscles over fractured vertebra. If the doctor believes there is a compression fracture, X-rays are ordered. X-rays can show fractures of the vertebrae. When an X-ray confirms a compression fracture, computed tomography (a CT scan) may be ordered. This is a detailed X-ray that lets the doctor see slices of the body's tissue. The image can show whether the compression fracture has caused the area to become unstable from the injury. If symptoms suggest problems with the spinal cord, the doctor may combine the CT scan with myelography. To do this, a special dye is injected into the space around the spinal canal (the subarachnoid space). When the CT scan is performed, the dye highlights the spinal cord and spinal nerves. The dye can improve the accuracy of a standard CT scan for diagnosing the health of the spinal cord and spinal nerves. Magnetic resonance imaging (MRI) can show the doctor problems affecting the nerves or causing pain. The MRI machine uses magnetic waves rather than X-rays to show the soft tissues of the body. It shows problems in other soft tissues such as the discs and spinal cord. This machine creates pictures that look like slices of the area your doctor is interested in. The test does not require special dye or a needle. Your doctor may order a bone scan to get additional information. This involves injecting chemical tracers into your blood stream. The tracers then show up on special X-rays of your spine. The tracers build up in areas of extra stress to bone tissue. This test can show if there are any old compression fractures, which would alert the doctor to problems with osteoporosis. If you have osteoporosis, the doctor will suggest ways to prevent future problems. The majority of patients with compression fractures are treated without surgery. Most compression fractures heal within eight weeks with simple remedies of medicine, rest, and a special back brace. Most patients are given medication to control pain. Although medications can help ease pain, they are not designed to heal the fracture. With pain under control, patients find it easier to get up and move about, avoiding the problems that come from remaining immobile in bed. Patients are usually prescribed a short period of rest. This gives the fracture a chance to heal and aids in pain control. In some cases, the doctor may have a patient stay in bed for up to one week. Open surgical treatment for spinal compression fractures due to osteoporosis is infrequently needed. (Open procedures require larger incisions to give the surgeon more room to operate.) In rare cases of severe trauma, however, open surgery is sometimes required. Open surgery is done if the spinal segment has loosened and bone fragments have damaged the spinal cord and spinal nerves. This procedure is most helpful for reducing pain. It also strengthens the fractured bone, enabling patients to rehabilitate faster. 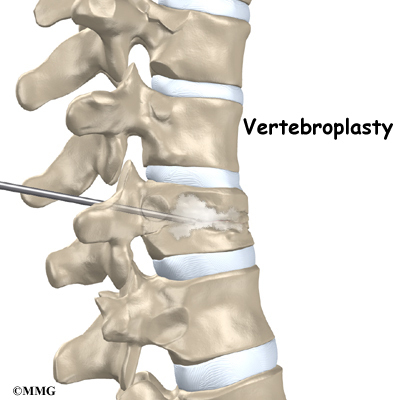 To perform vertebroplasty, the surgeon uses a fluoroscope to guide a needle into the fractured vertebral body. A fluoroscope is a special X-ray television that allows the surgeon to see your spine and the needle as it moves. Once the surgeon is sure the needle is in the right place, bone cement, called polymethylmethacrylate (PMMA), is injected through the needle into the fractured vertebra. A reaction in the cement causes it to harden within 15 minutes. This fixes the bone so that it does not collapse any further as it heals. More than 80 percent of patients get immediate pain relief with this procedure. 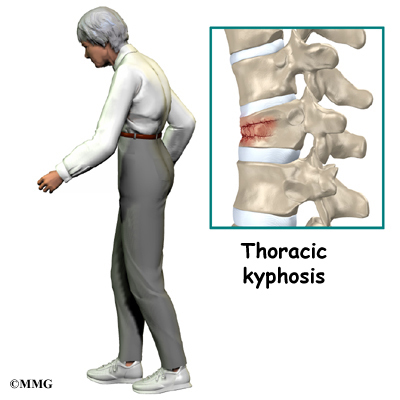 Kyphoplasty is another way for surgeons to treat vertebral compression fractures. Like vertebroplasty, this procedure halts severe pain and strengthens the fractured bone. However, it also gives the advantage of improving some or all of the lost height in the vertebral body, helping prevent kyphosis. Two long needles are inserted through the sides of the spinal column into the fractured vertebral body. These needles guide the surgeon while drilling two holes into the vertebral body. The surgeon uses a fluoroscope (mentioned above) to make sure the needles and drill holes are placed in the right spot. The surgeon then slides a hollow tube with a deflated balloon on the end through each drill hole. Inflating the balloons restores the height of the vertebral body and corrects the kyphosis deformity. Before the procedure is complete, the surgeon injects bone cement into the hollow space formed by the balloon. This fixes the bone in its corrected size and position. 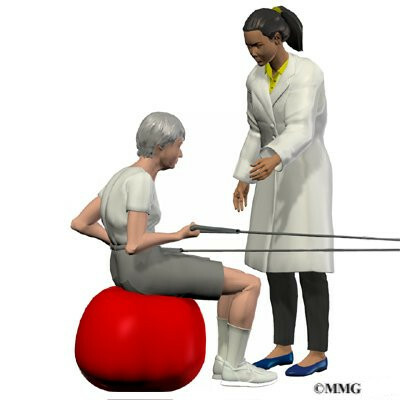 Rehabilitation after traumatic vertebral fractures can be a slow process. In these cases, patients sometimes need to attend therapy sessions for two to three months and should expect full recovery to take up to one year. Most spinal compression fractures caused by osteoporosis get better within eight weeks. As mentioned, most patients who suffer compression fractures from osteoporosis don't require surgery. Instead they are treated conservatively. Patients who were fit with a special brace are usually able to begin increasing their activity level after about one week. However, patients are encouraged to avoid strenuous activity until their doctor approves resuming normal levels of activity. People who have back pain generally find their pain improves as the fracture heals. However, the fracture changes the way the spine works, so it is not unusual for patients to have some lingering soreness in the muscles and joints near the fractured vertebra. If pain continues, let your doctor know. After six to eight weeks, doctors may have their patients begin a period of physical therapy. This is especially true when patients lose muscle tone, are deconditioned from having to limit their activities, or have ongoing pain. At first, treatments help control pain and inflammation. Ice and electrical stimulation treatments are commonly used to help with these goals. Your therapist may also use massage and other hands-on treatments to ease muscle spasm and pain. Treatments are also used to improve posture. A combination of flexibility, strength, and postural exercise may be all that is needed to help your posture. Sometimes patients may need additional support with either a rigid brace or a fabric corset. Your therapist also works with you on how to move and do activities. This form of treatment, called body mechanics, is used to help you develop new movement habits. This training helps you keep your back in safe positions and avoid extra strain near the fracture as you go about your work and daily activities. Training includes positions you use when sitting, lying, standing, and walking. You'll also work on safe body mechanics with lifting, carrying, pushing, and pulling. The therapist periodically tests your posture, balance, and strength to see how well you are improving. The therapist's goal for you is to become proficient and safe with your exercises and improve your posture, strength, and flexibility. The therapist gives you tips on how to avoid future problems. When patients are well under way, regular visits to the therapist's office end. The therapist continues to be a resource, but patients are in charge of doing their exercises as part of an ongoing home program.